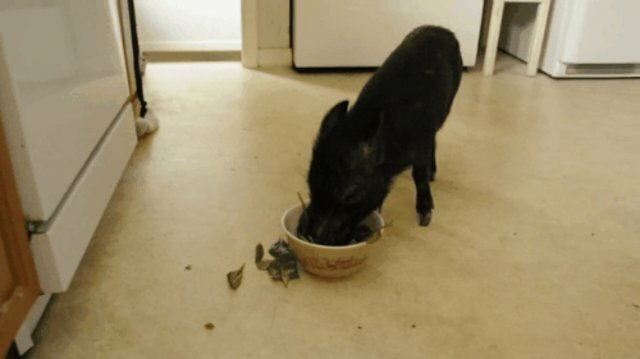 Don't be fooled by the "teacup pig" myth! The micro-mini pig craze has exploded over the past few years. There are YouTube pig celebrities. There are "trendsetters" like Victoria Beckham and Paris Hilton cooing over their tiny pigs. There was even a teacup pig appearance on How I Met Your Mother. But the acceptance of mini pigs as pets is the result of misleading claims (dating back to the 1980s) that can truly hurt innocent pigs. 1. Teacup pigs are really baby potbellied pigs. At first glance, it sounds purely adorable: a pig who will never weigh more than a human baby. But, as the executive director of PIGS Animal Sanctuary Melissa Susko confirms, this isn't the case. "There really is no such thing as a teacup pig, micro-mini, Juliana, etc.," she tells The Dodo. 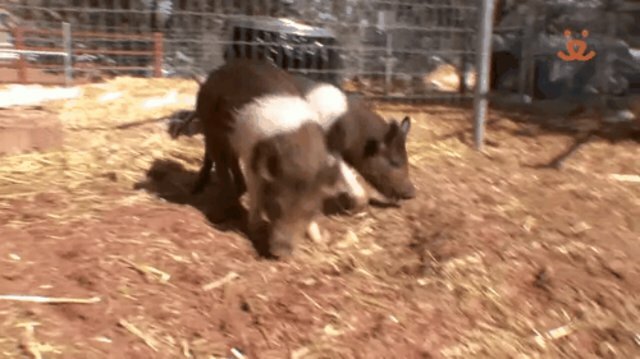 "Miniature pigs are mini compared to a domestic farm pig that can reach 600-plus pounds. So-called teacups are actually potbellied pigs who are either underfed to stunt their growth or who are sold under false pretenses." 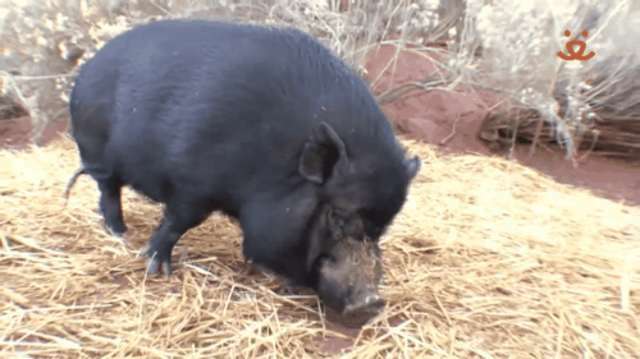 Potbellied pigs (Sus scrofa domesticus) are wild boar cousins from Vietnam who are in fact miniature pigs when standing next to huge farm pigs (who can weigh more than 1,000 pounds) or even wild hogs (who can weight 450 to 700 pounds). However, potbellied pigs still grow to between 100 and 150 pounds on average - nowhere near small enough to fit into a teacup. In fact, the smallest size that is healthy for these little guys is around 60 pounds (though that could be underweight, depending on the pig). 2. They can breed when they are just 3 months old. To convince customers of their pig's minuscule size, breeders may invite them to look at the piggy parents. Don't be fooled, says Susko. Because these pigs "can breed when they are as young as 6 to 8 weeks old, the parents of a piglet may be piglets themselves." Therefore, she says, "their size is not an accurate measure of how large their offspring will be in adulthood. Potbellied pigs can grow until they are 5 years old and reach well over 100 pounds." 3. 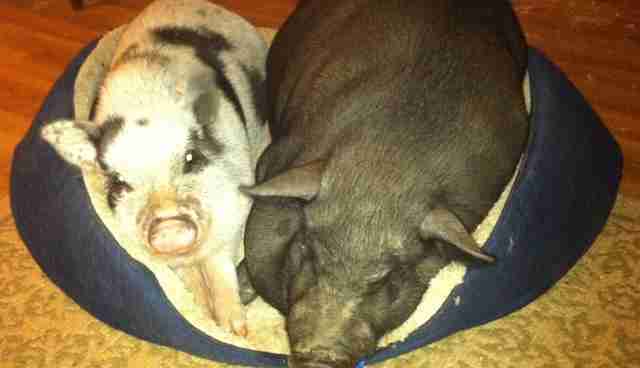 Keeping pigs that small is simply unhealthy. Some breeders inbreed their pigs to try to achieve a smaller size, but that produces a host of health issues resulting from reduced genetic diversity, such as squished snouts, which cause breathing problems later in life. And breeders often instruct buyers to feed their pig a diet that amounts to starvation. 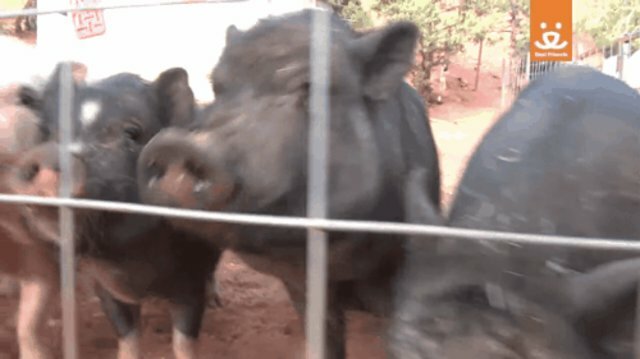 Susko says her sanctuary takes in numerous pigs turned in by people who said they "were told by the breeder that the pig will only get big if you feed him too much. Many pigs come in malnourished and emaciated. Underfed pigs also suffer from weak immune systems, sensitive skin and hoof problems." Indeed, underfed pigs - like too-little Wilburt here - tend to come with a host of health problems caused by malnutrition. Wilburt was fed guinea pig food to keep him small, but after being surrendered to a shelter, this curious 2-year-old is on a more appropriate diet of fruits and vegetables. 4. And it makes them unhappy. Potbellied pigs need other piggy friends and lots of space to roam - otherwise they can become depressed or angry. Pigs love to root, dig, roll in mud and splash in water. Their intelligence makes them exceptionally curious animals who will probably get into some trouble when they're bored, just like a toddler, and they can get territorial and moody, too. Pigs simply being pigs is oftentimes enough of a reason for teacup pig owners to abandon their pigs or surrender them to sanctuaries like Best Friends Animal Society or Pig Placement Network. The Dodo reached out to Janette Reever, the Humane Society of the United State's (HSUS) deputy manager of animal fighting response for the Animal Rescue Team, for comment on the pet pig craze. 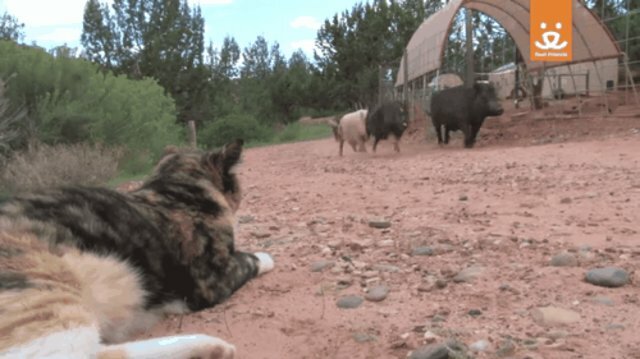 Between her former job as an animal control officer, her current position at HSUS and her active volunteer work at PIGS Sanctuary, Reever says she has "seen firsthand countless pigs that were surrendered to shelters, rescues, and dumped because the 'teacup' pig grew to 100-plus pounds." Reever shares her home with two such rescues from PIGS Sanctuary - Annabelle and Arnold (pictured below) - and she "can attest to how smart they are, how closely they bond to their families and the specialized care they require." 5. Keeping pigs is more expensive than you may think. 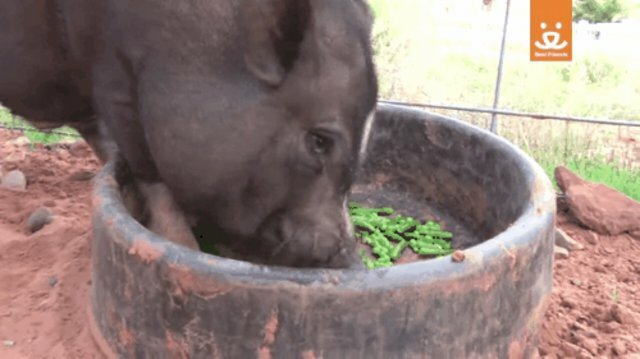 Because customers expect these piglets to stay tiny, they can't possibly imagine the mountainous costs associated with keeping a fully grown potbellied pig. As Susko puts it, "Many people think they are buying a teacup Yorkie and end up with a Saint Bernard. 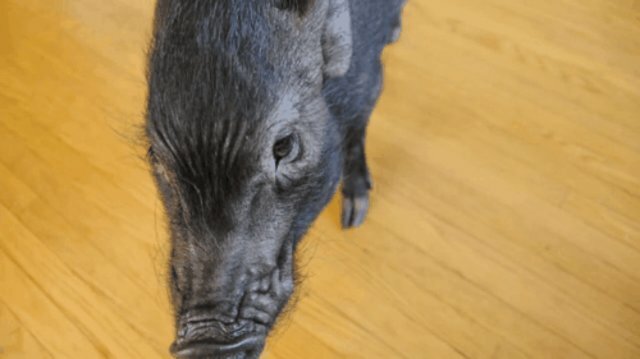 Not many people can handle a 100-, 200- or even 300-pound pig in their house." There's the initial price of the pig, which may be several thousand dollars, the proper food (no dog or cat kibble), the space needed, the vet bills (finding a good vet for these piggies can be almost impossible), sterilization costs and the expenses for a qualified pig-sitter if the humans go out of town and don't take their pal along. 6. They also may be illegal. No matter what teacup pig purchasers may think or how small their pig may be, in the eyes of the law, these little pigs are livestock - just like farm pigs or cows. Many local governments outside of farm country forbid the keeping of livestock, so it might be illegal to keep these pigs as pets, even if you do have the money and the ability to care for them. Unfortunately, the prevalence of misinformation about the care of these complex creatures means that most teacup pigs live only about five years, even though "the average life expectancy for a potbellied pig is 12 to 18 years," according to Susko. "We've had some that barely made it past two years of life." And their popularity doesn't seem to be waning anytime soon. "I have been at the sanctuary since 2002 (going on 13 years) and have worked with well over a thousand pigs during this time," Susko says. "We get an average of 30 requests a week to take in pigs that people have purchased under the assumption that they will be micro or teacup pigs. When the pigs start growing, they call us. We have 120 potbelly pigs here at PIGS and 85 percent of them have been pigs that people bought without doing their research and fell for the teacup pig myth." 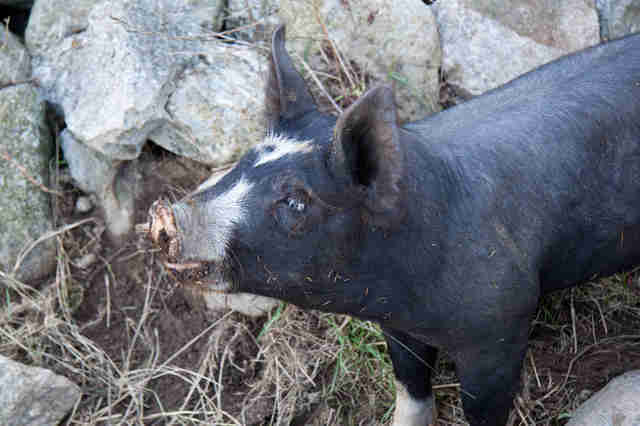 Don't be "pignorant" - find more information about "teacup" pigs here. When you see photos or videos tagged "teacup" or "micro" pig, remember that many of these pigs have a hard time finding a forever home after they no longer fit into that teacup. "It is an unethical industry," cautions Reever, "and the victims are the pigs." Instead of an actual pig, why not gift a pig sponsorship? There are also plenty of opportunities to donate to shelters that provide the proper care for abandoned or surrendered pigs.